Light weight, dimensional accuracy, corrosion and friction resistance are some of the salient attributes that make our Copper Cathodes highly popular among buyers. These cathodes are manufactured using quality approved copper at our vendors’ end. They also test Copper Cathodes on the parameters of quality, durability and functionality. 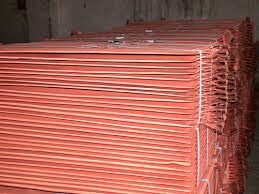 We are enlisted among the reputed Exporters and Suppliers of Copper Cathodes from Thailand.